The Icelandic firm Skaginn 3X has signed a contract to supply a state of the art processing factory to Collective Farm Fishery by V.I. Lenin in Petropavlovsk-Kamchatskiy on the Kamchatka Peninsula in Russia Far East. The factory will be equipped with leading technology to grade, pack and freeze species such as Alaska Pollock, Pacific Cod, Wild Salmon, Squid as well as some species of Pelagic Fish. 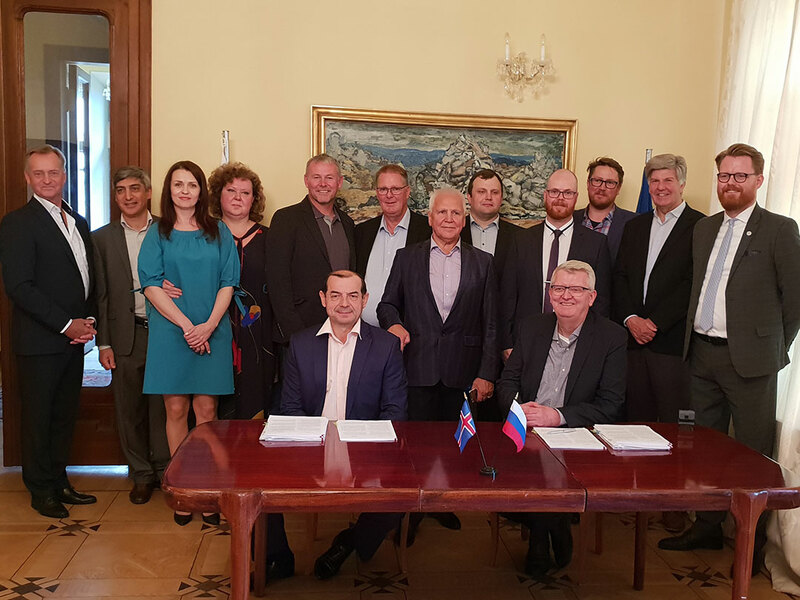 The contract was signed at a formal ceremony at the Icelandic Embassy in Moscow on July 25th. The Icelandic refrigeration specialist Frost has been chosen to take care of all refrigeration in the new factory. The combined efforts of Frost and Skaginn 3X are materialized by Knarr Rus who represents Icelandic technology companies in the Russian market. The state of the art refrigeration system will live up to the latest international standards in energy efficiency. The system includes advanced freezing technology with automatic plate freezers for both fillets and whole fish, enabling high quality end products. Furthermore, the system has means to allow IQF freezing of all key products. In total the factory will be designed to freeze more than 500 Tons of fish per day, with possibilities to expand the capacity in the future. The signing of the contract is an important landmark for both companies, however the biggest celebrations will be withheld until the end of 2019 and beginning of 2020 when the factory will be up and running. Even though the companies are on separate ends of the world with 12-hour time difference, they share some traits. One example is the passion for seafood and the fact that both have headquarters in fishing towns on a peninsula, in fact the first part of the name of Skaginn 3X is Icelandic for Peninsula. The owner and CEO of Skaginn 3X has high hopes for the new factory. “For us it is very important to contribute to improved utilization of fish, our ability to apply our total system integration approach is a key to make this happen. This is in fact similar as the development has been in Iceland where we strive to maximize the value of every fish”, says Ingolfur Arnason.